In this “Your Town” report we are taking a deep look into Bedford as a whole and looking at sales numbers for 2014 versus 2013, along with how the towns along its borders did, as well as what’s currently on the market in town right now. 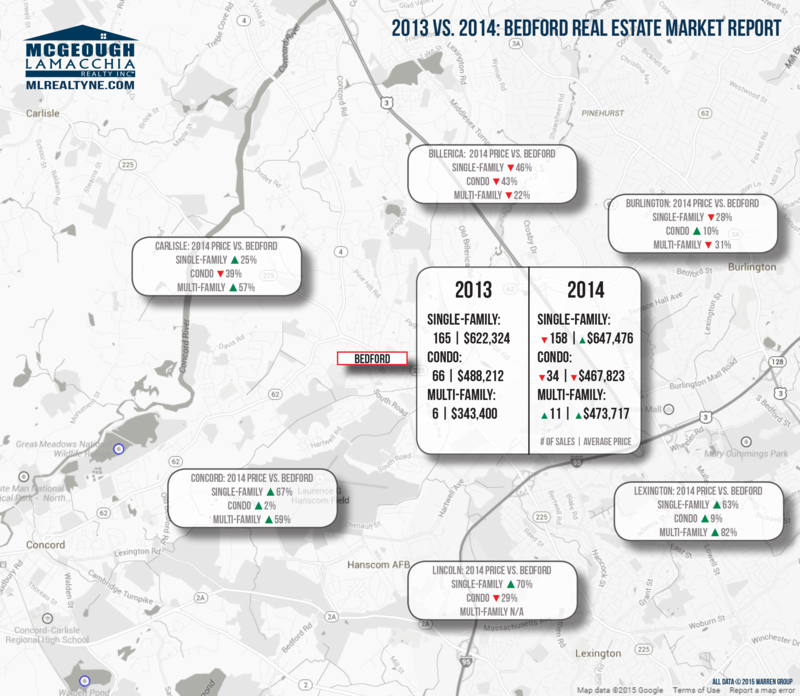 Overall, the housing market remained relatively strong in Bedford in 2014, with a total of 203 homes sold at an average sale price of $529,672. The 203 number includes single-family homes, condominiums, and multi-family homes. That meant a nice increase in the overall average home price, with homes selling for 8.6% more than in 2013. 33 fewer homes sold in 2014 than in 2013, which is part of a trend that contributed to overall home sales in Massachusetts being down 1% in 2014. Single-Family Homes: 158 sold in 2014 versus 165 in 2013, for an average price of $647,476 which is a big increase from the previous year’s average of $622,324. Condominiums: 34 condos sold in 2014, versus 66 in 2013, at an average price of $467,823, a decrease from 2013’s average of $488,212. Multi-Family: 11 homes sold in 2014, as opposed to 6 in 2013. The average sale price in 2014 was $473,717, a giant boost from the previous year’s average price of $343,400. Next, looking at the towns that Bedford shares a border with, we see that the town remains affordable compared to Lexington, Lincoln, Concord, and Carlisle, where a single-family home can cost up to $446,890 more when you look at average sale prices (see graphic above for a breakdown by town). Billerica and Burlington come underneath Bedford’s average price for a single-family home by anywhere from 28-46%. 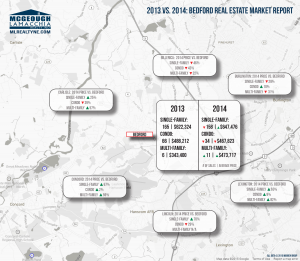 As of today, March 4, 2015, there are 18 single-family homes on the market in Bedford, with an average listed price of $1,085,544. 5 condominiums join them, with an average asking price of $396,180, and there are currently no multi-family homes on the market. That is a total of 23 homes on the market, as compared with 20 on the market one year ago today. With interest rates in the 3.75% range right now, and very few houses on the market in Bedford, there are positives for both buyers and sellers — buyers can take advantage of the lower interest rates, and sellers benefit from there being a lower supply, which has resulted in higher prices in many cases. Bedford is a residential community of 12,595 as of the 2010 US Census. It was settled in 1640 and incorporated in 1729, and features several historical landmarks and artifacts, including the Bedford Flag, the first battle flag flown in the American Revolutionary War, and the Fitch Tavern, where an alarm sounded warning in April 1775 that the British were marching from Boston to Concord. Located with easy access to Routes 3 and 95, and on mass-transit bus routes, Bedford makes an excellent location for commuters, with an easy 30-minute trip into Boston by car. A number of restaurants in town offer dining opportunities, and dedicated open spaces in town afford recreational chances as well. With so much to offer, it’s no wonder that Beford remains a highly desirable place to live and own a home.